I love my hashtag #farmkitchencook. I love looking at the photos of foods I make while cooking at Nine Mile Farm. I have a notebook with recipes and notes I hope to blog, but I do not get to do every week. But I always take pictures and you can see them on my Instagram feed. I am posting at least one photo of something I cook everyday in my kitchen. 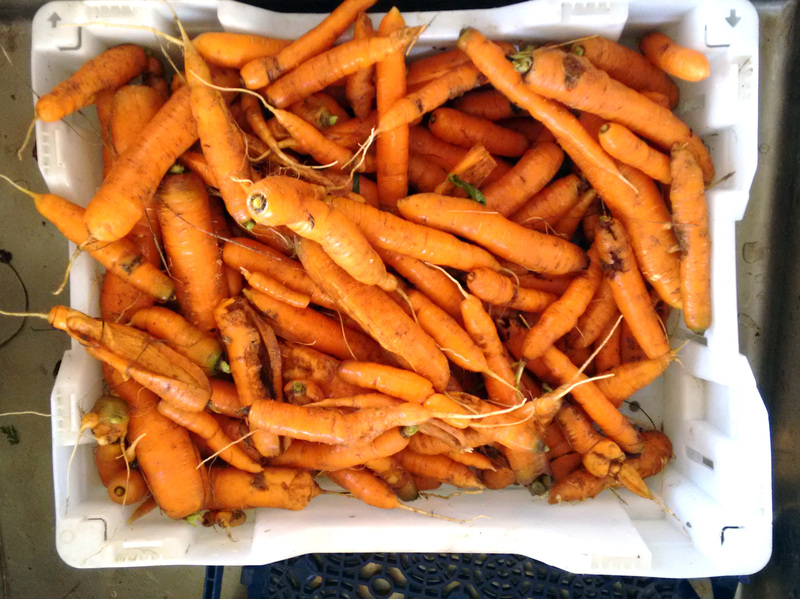 We started with lots of carrots “seconds” or “imperfect” carrots, that were very beautiful and delicious. We made 3 batches! I used a kitchen brush to clean this organic carrots. I did not peel them. We decided to use some cabbage to keep a good fermenting environment as it has been very hot in Upstate New York this week and this ferment is ready in about 4-5 days. In a large bowl, mix carrots, cabbage, ginger, turmeric and sea salt. Using a potato masher, press until there is enough liquid to cover the produce. Transfer the carrot/cabbage mix to a gallon glass jar, pressing to submerge completely underneath the liquid. Cover with a large cabbage leaf, add weight to keep the produce submerged under the brine. If you do not have enough liquid from the vegetables, make extra brine. For the brine, mix 1 TBSP of salt with one cup of water, stir well and add to the vegetables as needed. Cover the jar with a tight lid or use paper towel secured with a rubber band. I like to use a cabbage leaf or a piece of fruit like a pineapple round, depending on the jar and add another jar inside to keep all the vegetables under the brine. Ferment at room temperature (60-70°F is preferred) until desired flavor and texture. We like it firm so 4-5 days in the summer time. (If using a tight lid, burp daily to release excess pressure.) If the ferment start to dry, add more brine. 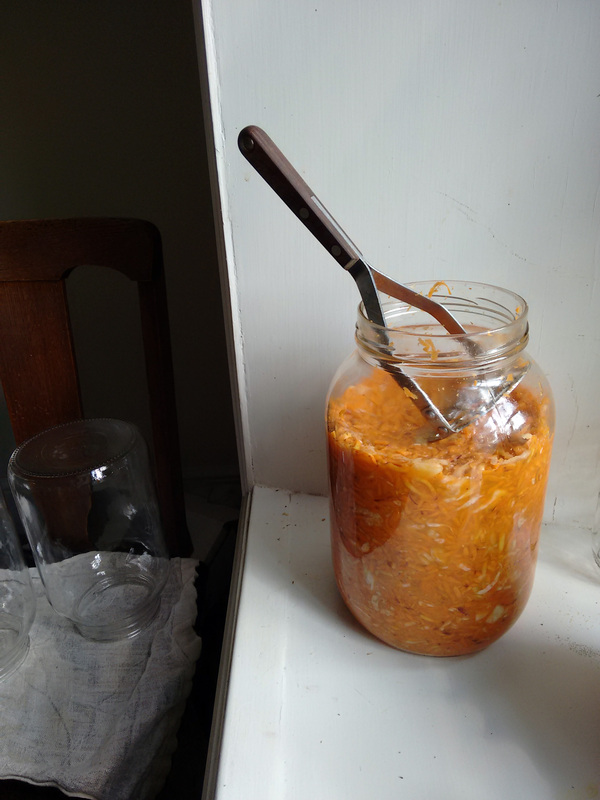 Once the ferment is done, put a lid on the jar and move to the fridge. Yummy can’t wait to try this. Can I use dried turmeric? 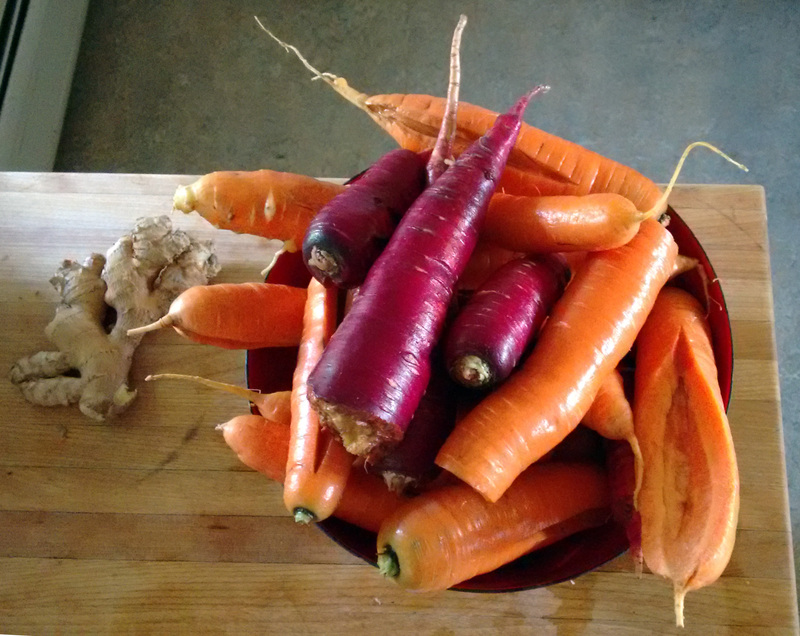 My ND wants me to eat more fermented foods and I just dug up my carrots. Hi I have used dried before, but I do like the root if you can find. Hope you are able to try the recipe. Seriously.. thanks for starting this up. This website is something that is needed on the internet, someone with a little originality!